In Janwaar we radically rethink the idea of a “school”. Many of us agree that the existing education system doesn’t meet the needs and knowing that good teachers won’t stay for long in such a remote area – we decided to make our Janwaar kids fit to run their own school. Together with Prakriti school in Noida we are setting up a two year program for five kids to make them fit for the purpose. The assessment Tonmoy conducted in Janwaar was the first step to achieve the goal. It’s an experiment and we are fully aware that we might fail – but out-of-the-box thinking is desperately needed to close the existing gaps and come up with something more suitable. Here follows the “report” written by Tonmoy who conducted the assessment in Janwaar – it’s a very personal experience he is sharing and worth the longer read! Tonmoy sitting at Arun’s homestay where he stayed during his visit. It was sometime in early July when I received a message from Ulrike – “can you give me a call – I might have a very interesting two day job for you with Prakriti’’. As she explained my job would be to help Prakriti conduct an educational assessment of a few selected kids of Janwaar. I was hooked to it right from the beginning and in the end, the only reply that I could think of was – count me in. 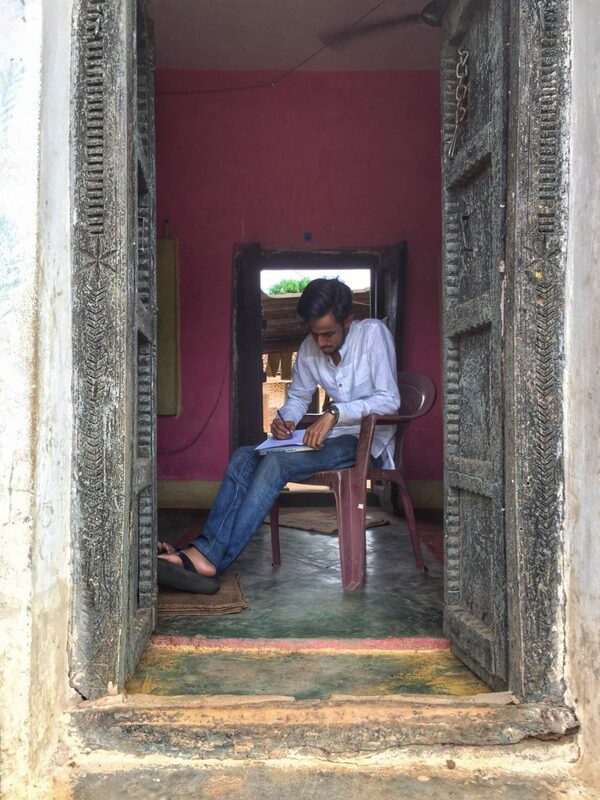 Janwaar as a village interested me because of all the stories I had heard about it – a village I wanted to explore further. With the job in hand I felt excited. In fact, right since my school days, I would venture out and conduct such kind of assessments in some of the government schools, back in my hometown in Assam. Also to experience rural India and village life was something I was longing for since a long time. I left for Janwaar in the first week of August. After a quick tour of the village, I began with the educational assessments. It included three categories – math, language and environmental studies (evs). Right since the first assessment, I knew the disappointing results that were about to show up. When it came to math, the kids faced a lot of difficulties in identifying the place value of the digits, solving the word problems, multiplication, etc. Their performance in evs was comparatively satisfactory. In the language assessments, the kids faced a lot of difficulties in reading the passages due to which, answering the questions, which followed the comprehensions became a tough task too. The kids couldn’t translate some basic HIndi words into English. Their poor performance in English was something that was expected as they all go to Hindi medium schools but their poor performance in Hindi, was something that wasn’t expected. After the assessments I paid a visit to the teachers of the government school and they started stating those usual problems of poor infrastructure, high student-teacher ratio and so on. Then the “blame game” began: first they blamed the government and then the parents for the poor performances of the kids. Though these are problems that need to be addressed, the teachers should make the utmost use of whatever is available to them and dutifully complete their tasks because in the end, we cannot let the children be the victims of a vicious cycle of problems and the never ending blame game. 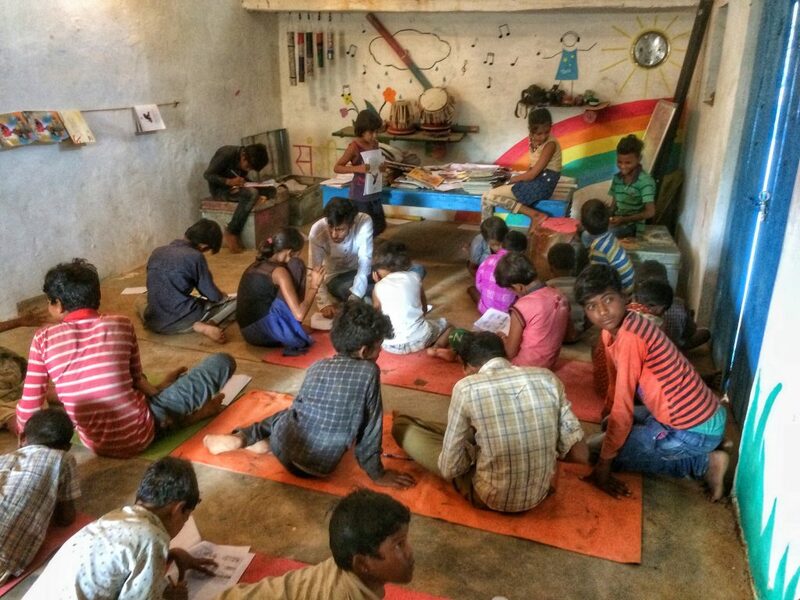 A lot needs to be done when it comes to the educational scene of villages like Janwaar. Firstly, building a strong foundation along with getting the basics right in the kids is very important. However, most importantly, education should come across as something which is fun rather than boring and burdensome. Mind you, the kids are very talented and skilful. Kids in the villages aren’t born stupid. The only difference being, their sets of skills are in a different field and they are talented in a different way. We don’t need to make them toppers, we just need to equip them with the basics and for the rest, their set of skills and talents are enough. The best part was the fact that the kids had the zeal to learn and if you took the effort to make them understand, they understood. Therefore, somewhere down the line, it’s the system that is fatally failing. The village life was a treat to me. Away from all kinds of commotion, the silence that prevailed in Janwaar was heavenly. The weather and the winds were like the cherry on the cake. Gazing at the fields and once it got dark, gazing at the stars with some Assamese melodies in the backdrop would be my favourite pass time. Village life is full of discipline, much more disciplined than most of urban India. Circumstances have made the people tough and they are much more organised than their urban counterparts. Everybody took his or her responsibilities very seriously. The best part about the entire trip was Janwaar’s network issue though. My phone was always out of coverage. It made my trip very peaceful. This made me realise how phones and social media have taken over our lives, which has thereby reduced our peace of mind. We remain so engaged over our cell phones that we forget to give time to our families and to ourselves. After dinner, Arun and his family would sit down and the entire family would converse. This looked like their favourite pass time, as the electricity issues would not allow them to watch television and the network problems would not let them gaze at their phones. I couldn’t understand what their topic of conversation was but it did sound intense and it did seem like, they were having a lot of fun. This made me realise that these are the kind of conversations that eventually lead to a strong family bond (something that is in decline in urban India), as they are real conversations and not “virtual” ones. There is so much to learn from these village people … we “urbanistas” should always keep this in mind.